I once heard the male Australian King Parrot, Alisterus scapularis, described as “riotously colorful” and have since come to agree with that sentiment. The females’ subtle but beautiful plumage stands in sharp contrast to that of the males’…so much so that the sexes may easily be taken for different species. The Australian King Parrot’s extreme sexual dimorphism and startling colors have led many to compare it to the Eclectus Parrot. Although a bit smaller than its magnificent cousin, the Australian King Parrot is in my opinion no less beautiful, and usually makes a wonderful pet as well. The fire-red to scarlet head and back of the Male Australian King Parrot contrasts dramatically with the dark green wings and back. 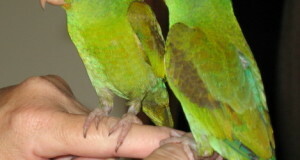 Females sport pale lime green feathers in place of the males’ red, and their under-parts are a unique shade of pinkish-orange. Two subspecies and two related species – Green-Winged King Parrot and the Amboina King Parrot – have been described. Australian King Parrots are found along Australia’s eastern coast, where they occupy a narrow range extending from northern Queenslandto southern Victoria. They inhabit tropical rainforests, riverside thickets, Eucalyptus woodlands and mountainsides to a height of approximately 5,000 above sea level. Some populations move inland to parks, farms and gardens when foraging. Wild Australian King Parrots are often described as being quieter than related species and “more deliberate”, or slower, in their movements. Their social structure is somewhat unique among parrots, with juvenile birds forming flocks but others living in pairs and small family groups. Males display by puffing out their head feathers while simultaneously drawing the body feathers tight and fluttering the wings. Receptive females follow suit, after which they are fed by their prospective mates. During courtship displays, the pupils of the males’ eyes are said to dilate while those of the female contract. Tree hollows within densely-forested areas are favored as nest sites. The female broods her 3-6 eggs for approximately 20 days while the male remains nearby. The chicks fledge at 5 weeks of age but remain with their parents for quite awhile afterwards. The male’s adult plumage develops slowly over a series of molts beginning at age 16 months. Complete mature coloration is not achieved until nearly 3 years of age, but breeding is possible before that time. Australian King Parrots are invariable described as “calm, quiet and sweet” by their owners. They tame readily and are quick to bond with gentle, caring owners – loud, hectic surroundings (or people!) are not well-tolerated. Australian King Parrots can learn to mimic words, but are not considered to be great talkers. A calm bearing does not mean that Australian King Parrots can be kept in close confinement. Like all Psittacines, they are active and intelligent, and must be given ample opportunities to exercise both body and mind. A large parrot or macaw cage, along with frequent out-of-cage time, is a must. Breeding is most likely in an outdoor aviary. Australian King Parrots have hybridized with Red-Winged and Superb Parrots. Please write in for more detailed information on care and feeding. Next: Escaped Pets are Teaching Flocks of Wild Cockatoos to Talk! Hi Frank,Thought you might enjoy our web site especialy the King Parrots.Enjoy. Thanks for your interest…some great birds you are working with there; especially nice to see them in outdoor aviaries.